"Am I dead?" "I don't think so… You're talking." A24 has released a fantastic new red band trailer for Swiss Army Man, the wacky indie comedy from Sundance this year. It stars Daniel Radcliffe as a farting corpse that also has other special abilities - as you'll find out in this trailer. Paul Dano stars as a man stuck on a deserted island until this corpse suddenly shows up, helping him come back to life again. Even if you've heard enough and already want to see this watch the trailer - but especially if you're curious, this is a must watch. They show quite a bit but it's a rather beautiful trailer capturing the vibe of the film. Which is rather hard because it's so unique. Mary Elizabeth Winstead also appears in this. Fire up the new trailer below. 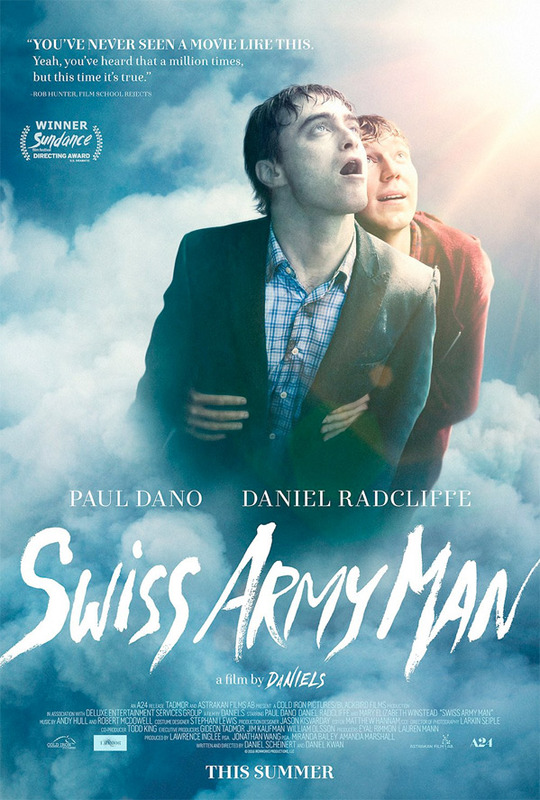 You can also go back and watch the first teaser trailer for Swiss Army Man here, to check out more footage. This looks soooooo crazy, but A24 has a good track record of well-made films about uncomfortable topics. This looks too good to pass over, an awkward type of funny that can make the movie. I'm excited for this. As a short, I would probably be interested in watching it. As a full length movie, not sure if I want to watch a farting corpse being dragged for 2 hours.